The minibus’s rear wheels slipped sideways over the gravel. That didn’t stop our transport from flying forward. At every blind corner the driver tapped the horn to alert oncoming drivers that he had the right of way. It was a prudent measure, because 90% of the road was just wide enough for one car. 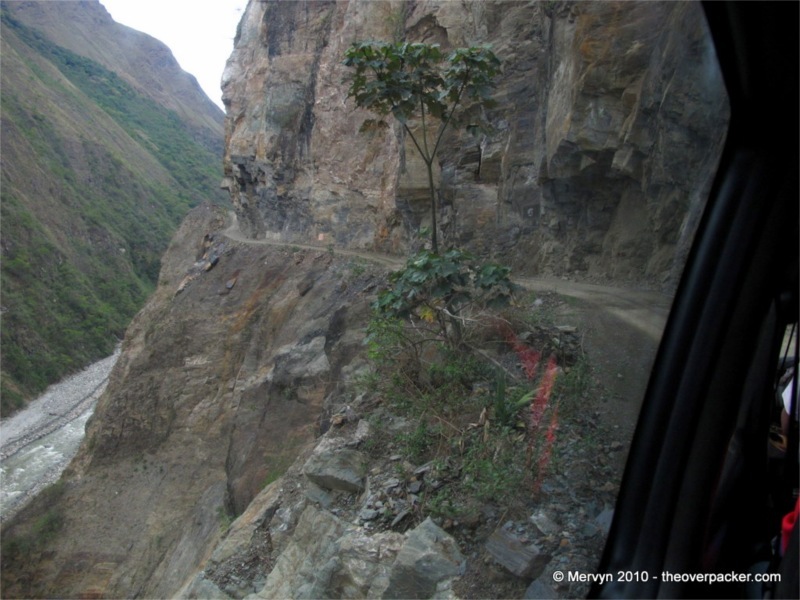 The road was also perched between two cliffs—the one on the right went up, the one on the left went down to the river. Way down. Occasionally, the cliff on the right wrapped itself over the roof of the car just to prove that no god—Catholic, Incan, or otherwise—intended this mountain to have a road. The sacrilege of dynamite has, however, allowed men to defy that divine decree. I don’t care what anyone else says, this is the world’s most dangerous road. If as many cars used this road as the reigning title holder in Bolivia, the body count would rival the population of Lichtenstein. Journeys like this are why I travel. There is no equivalent to this back home, at least not legally. A road like this would be shut down or paved, or at least have another lane. Meetings would be held. Laws would be written. A passenger would sue our driver for intentional infliction of emotional distress. Here, you live with it. Better yet, you feel alive. At least twice, Dave turned around and gave me a wicked grin. Truth is: this is fun. We hopped this minibus in Santa Maria after a six hour trip from Cuzco on a regular-sized bus. The road of death was the only way to get to our next stop, Santa Teresa. Along the way, the driver stopped at seemingly random spots on the road to drop off locals. As we pulled away, you could look out the back window and see a just disembarked mother and child clawing their way up a gravel pile to their home high up the mountain. When our minibus met a vehicle going in the other direction, the pair would engage in a delicate dance where one would back its way up or down the winding road to a spot where there was enough room to pull over and let the other one pass. At one point our driver scorned an oncoming driver because he was scared to reverse. Coward was apparently in fear of his life. The bus from Santa Teresa to Hydroelectrica offered another peek into local life. 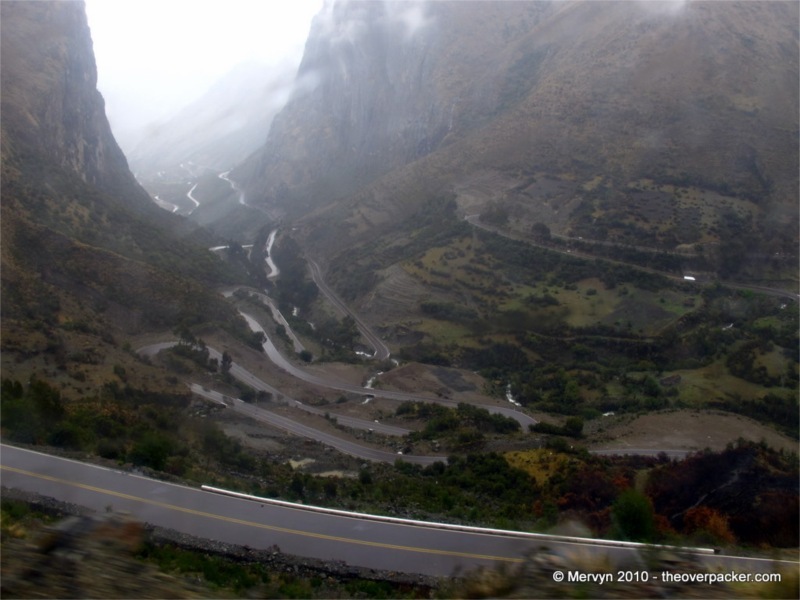 Dave and I crammed into a minivan with nineteen Peruvians and bounced our way along another most dangerous road. One guy stood in the open space next to the sliding door and hunched himself over a seated passenger while a little boy stood behind him clinging to the guy’s backpack. This didn’t stop the driver from putting his foot to the floor. On the upside, the overpacked bus seemed to dampen the road bumps; guess it’s harder to bounce up and down when the suspension’s maxed. Hydroelectrica (the colloquial name for the local damn) was the end of the road (literally: no more road), so we all fell our way out the minivan. The locals split for wherever they were going. 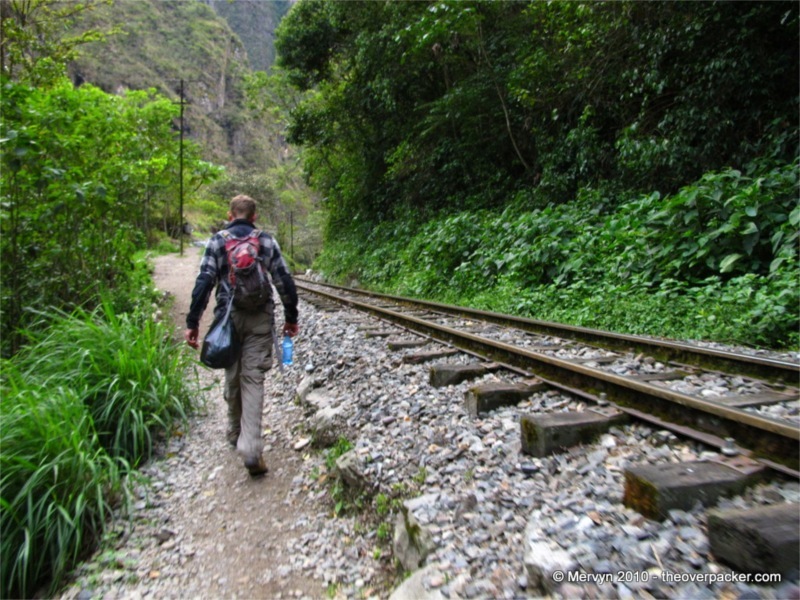 Dave and I started our walk along the train tracks to Aguas Calientes, the town that serves as the gateway to Machu Picchu. We could have bought a ticket for a 7 p.m. train to our destination, but what would have been the fun in that? For two hours we walked through the jungle following the train tracks. Every once in a while, we’d have to walk on the tracks themselves to cross ravines and streams, all the while glancing over our shoulders for a lurking train. 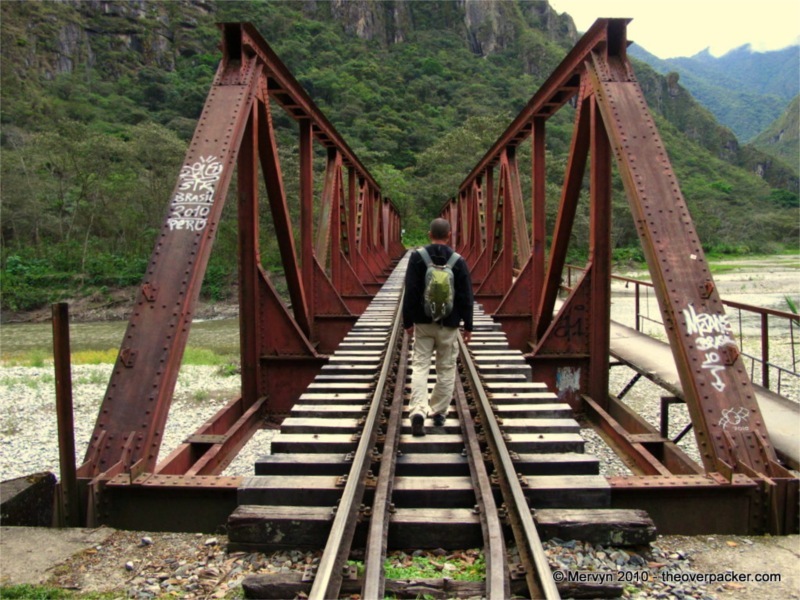 It was Peruvian Stand by Me. The sun dipped behind the mountains and we did the last few kilometers in the dark. The trip took longer than we’d anticipated and the last few minutes of our conversation were spent convincing each other we hadn’t missed a turn. Of course, we hadn’t. Sometimes life’s priceless adventures come from being cheap. 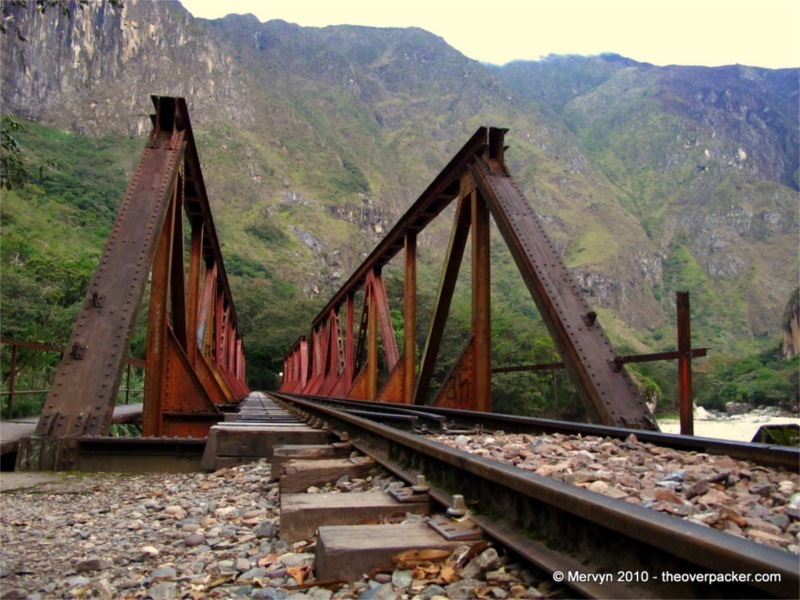 If you’re interested in alternative travel, be sure to read Mervyn’s how-to guide on traveling from Cuzco to Aguas Calientes without taking the train . It’ll save you $30 and put some hair on your chest. GALLERY: No bonus pictures today. Just the ones you see above. Be sure to check tomorrow’s gallery, though, because Mervyn will have visited Machu Picchu and will no doubt take way too many pictures. 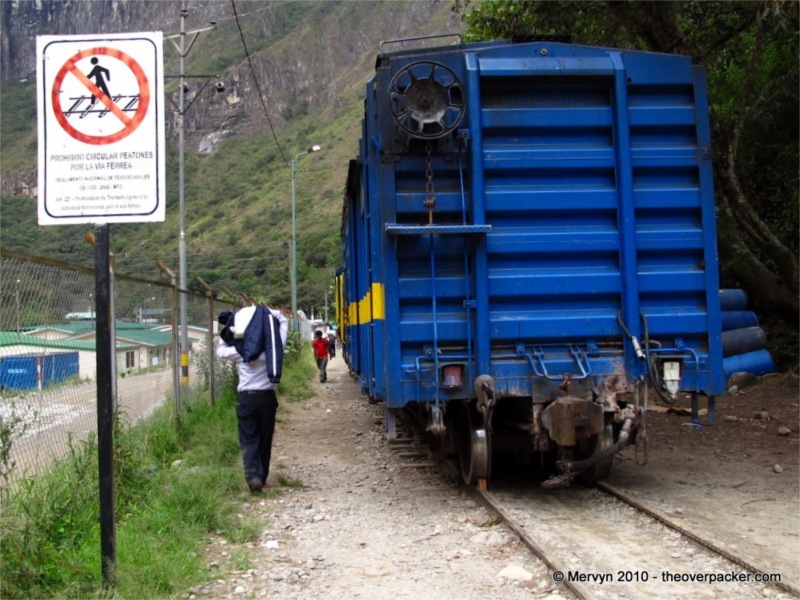 First time, we took the tourist train from Cuzco. 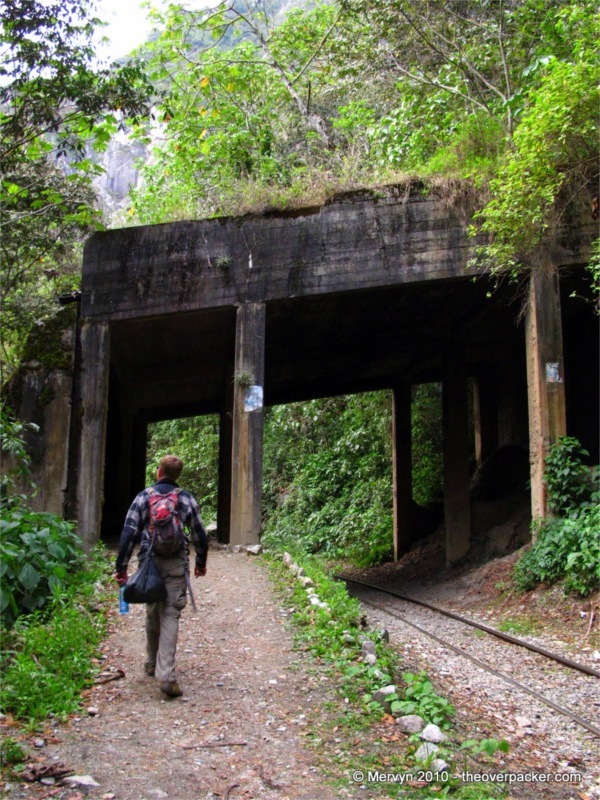 Had to share the ruins with mobs and leave well before we were ready – I practically ran up the trail to Huayna Picchu and didn’t see all of the major site. Next time, we got up early and rode the regular train down with the goats, chickens, bags of potatoes, etc. Nice people getting on at stations to sell us good-tasting stuff. We had an hour or two in M.P. to ourselves before the tourists arrived, and since we stayed overnight, we had time after everyone left, plus another couple of hours next morning by ourselves. M.P. is magical – ghosts everywhere. You constantly have the impression that around the corner you’ll walk into an Inca. Another place that impressed me this way was Kipling’s house in southern England – I was expecting to see him sitting at a desk, or in front of a fire. Not entirely sure what produces this in some places, but not others. Loved Down House, but never could really see ol’ Charles there. I’ll post on this shortly, but I agree that it’s worth getting up early and hitting Machu Picchu before the main crowds. More on the ghosts of Machu Picchu tomorrow. The Anne Frank house gave me that same feeling too. Also in the little museum and botanical gardens at the base of MP. It actually gave me the creeps. And Merv-I have definitely been on roads like that in California. You just need to look harder. Tell me more about these roads in California. I’ve never come across one. Haven’t been to Anne Frank house, yet…I can imagine it is filled with ghosts. By the way, just got done looking at a PowerPoint of photos of Machu Picchu sent by a different friend. In it, the text revealed that staying at the hotel by the entrance now costs US$700+ per night, so I guess we won’t be doing THAT again anytime soon!! Yeah. It’s not cheap. 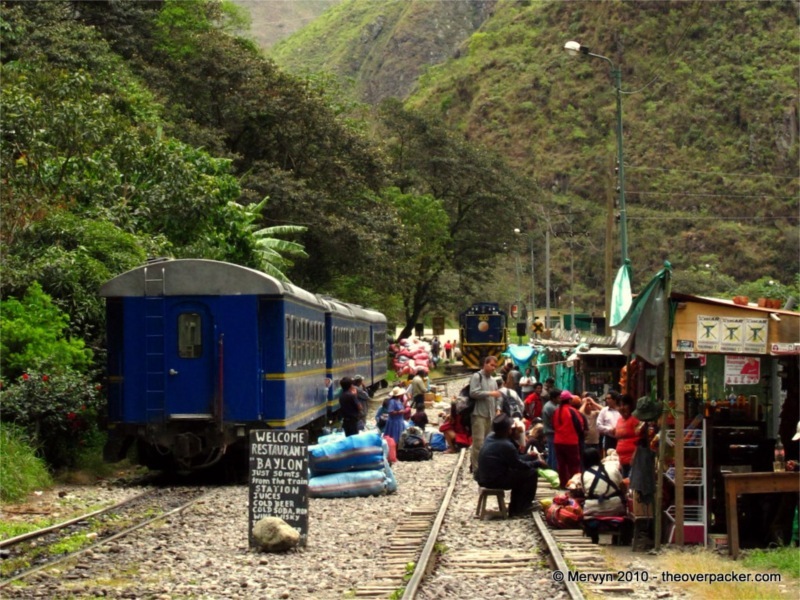 There are actually places in Aguas Calientes where you can pay over $1000 a night. The $10 place I stayed in suited my purposes just fine. It pleases me that there are still cheap places. In 1975, it was pretty much camp out, and we had no equipment with us; or stay at the bottom of the hill and climb up in the morning; or stay in the hotel near the entrance. I think we paid $30.00 for the room, and only because we’d been there with the tourists five years before and wanted a better experience.